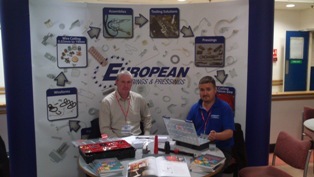 European Springs Drive Recruitment at Ford. The sad news of the scaling back of production at Ford Dagenham was first announced in October of 2012. In an effort to restructure the business to reduce costs, Ford has decided that the Dagenham Plant will concentrate on engine production, the consequence of which means the closure of the tool room and stamping departments. In an effort to help their highly skilled employees find other work, Ford invited European Springs to hold a recruitment event at the Dagenham Plant. We were especially keen to attend and spent three days meeting with many of Ford&apos;s skilled and knowledgeable employees to discuss recruitment. The sustained growth across all departments of European Springs means that we are able to offer positions to skilled personnel to help us meet demand. Our recruitment program is open to all candidates as well as Ford staff. If you have relevant experience in similar industries and would like to apply for a position with European Springs we would welcome you to send your CV for consideration. Please see our contact page for address details.